Hello, I'm Paul, also known as @psd and I've just joined GDS as a Technical Architect. First impressions are important but soon forgotten, so here are some of mine from the first day of working with the team. I joined GDS because there’s nothing cooler than working on something that touches so many peoples lives. 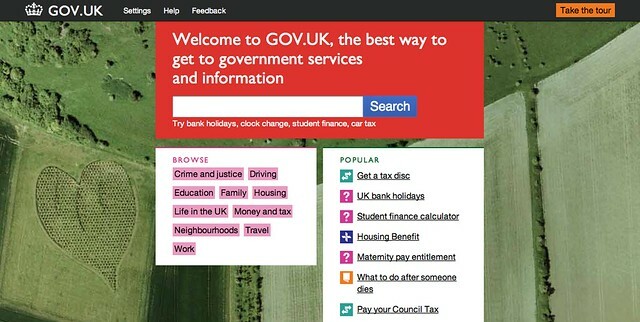 It’s not just the reach of the services being built for Gov.UK that I found attractive, but the importance placed on high quality, beautiful design and attention to detail. This is perfectly embodied by the “What to do when someone dies” page, which focuses on tasks and provides crucial information quickly and clearly. The vision of the team here at GDS is ambitious, as encapsulated by Ben Terrett’s post on design. I fully expect to to see the GOV.UK icons on tea towels in heritage shops in years to come. Working environments matter to me, and the GDS office is centrally located, well maintained and better appointed than most London startups I've visited, though sitting on one part of the floor can feel a little like being in a bouncy castle. There's a nice kitchen that's only missing one essential bit of kit: we could really do with a dishwasher! Rather impressively by lunchtime of my first day I'd been given a Cabinet Office Email address (accessible using Google Apps for Business), a laptop (a security hardened 13" MacBook Air), a mobile phone (an iPhone which I declined) and, most importantly, a building pass so I could go to the loo without a chaperone! Like most developers, I'm extremely picky about my external brain, so have elected to swap the 13" MacBook for the promise of an 11" sometime in the future. Looking across the floor it's difficult to tell who works for GDS and who doesn’t. There are no silos here; it is apparently not an elitist enclave. We don't have assigned desks, sitting next to whoever we happen to be working with on a day-by-day basis. To succeed, GDS has to break down walls and work with domain experts regardless of where they’re from — the Whitehall project, which is in full sail, is a hubbub of graphic artists, designers, front-end developers, copy-writers and policy wonks from across government. As you'd expect, most of our projects are up on github and released as open source, so I had seen and experimented with some of the code even before joining and ahead of James walking me through the emerging platform. Good people beget good people, and it seems every time I look up from my desk there's someone new and interesting visiting. It's easy to become blasé about comings and goings in the office, but I was particularly disappointed when I realised I'd just missed Margaret Calvert’s visit via a github commit message. In software development, “Architect” can become a term of abuse, implying someone who just assembles packages or engages in abstraction astronautics. After a day shadowing James and Mat, it's obvious the GDS “Technical Architect” role is more akin to that of a Master Chef, someone who ensures kitchens are working well, menus makes sense across restaurants, thinks strategically and mentors colleagues (though without the enlarged ego). A good chef cares about the ingredients and it was great to hear how a recent technical choice was made with a Ruby versus Scala bake-off, coded by James and Mat. As a hint of what is in store for me, Etienne and I looked at the documentation for a medium sized government procurement. It's mind boggling to see tens of millions of pounds allocated to “Software Licences”, and tasks of customising an off-the-shelf software package taking tens of thousands of man-days! There are few economies of scale in enterprise software; big projects are expensive to run because they're big, but shaving 1% off this budget would pay for ten GOV.UK betas. 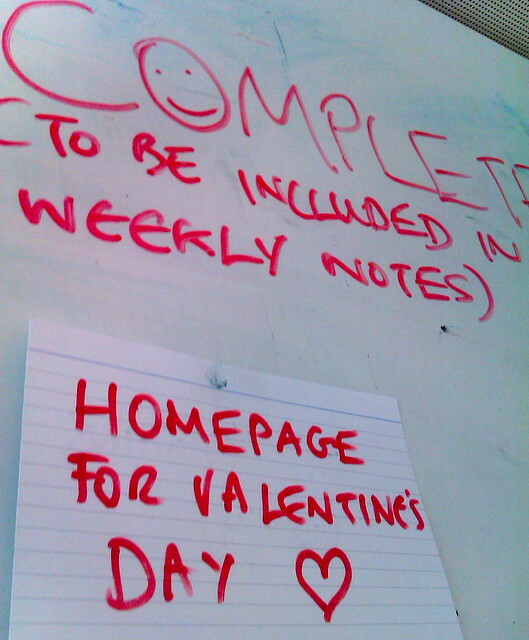 Just before heading home we decided to create a commemorative Valentine’s Day homepage for GOV.UK. 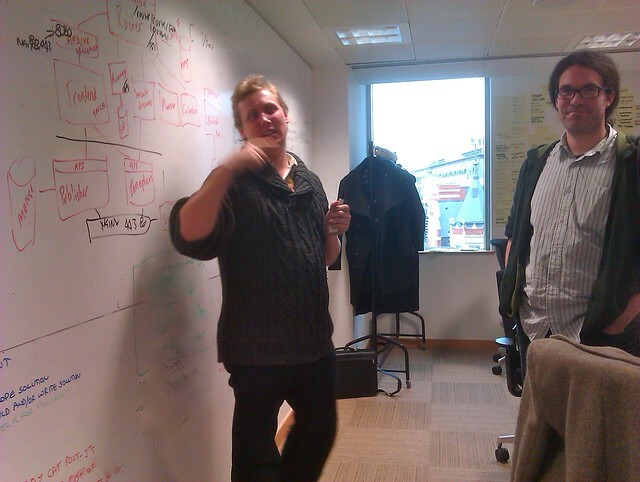 A Kanban card was added to the sprint wall and Ben quickly came up with a design. I sat with James Weiner and Dafydd Vaughan whilst we built, tested and deployed the new ‘heart-shaped wood’ homepage, meaning I witnessed concept to delivery all in the space of half an hour. Applying to join GDS was relatively straight forward. I spotted the job announcement on Twitter. A few weeks elapsed between submitting a rather lengthy form and being invited for an interview, but I was fortunate to quickly receive an offer, and just over a week later had signed paperwork and was ready to start. I gather the application process is even smoother now, replacing the long Word document with a more conventional CV and covering letter. Since joining, I've had a small insight into the other side of the fence, acting as one of three interviewers for Technical Architect (another me!) and Developer roles. 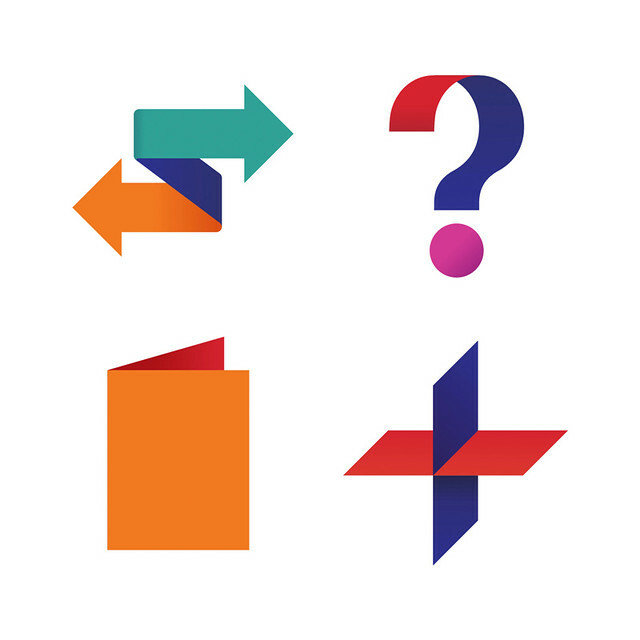 The process strives to be relaxed and fair to all candidates, with a standard interview striking a balance between the competency based questions required by the Civil Service and some straight-forward technology challenges at the whiteboard. Most developers enjoy the pairing exercise as it's an opportunity to show off what you know, and discuss different approaches to coding. If you like the sound of working with an amazing team to change the digital face of Government, we're still hiring for a wide range of positions. Thayer Prime (Thayer.Prime@digital.cabinet-office.gov.uk) is a great point of first contact. Sorry but the whole article reads like a blog (and that is not a compliment). Usual sins are committed in dis'ing the old and praising the new (without any real appreciation of either). If we all had the opportunity to start again with a clean sheet of paper, we would all do it differently, probably not any better as the constraints hider the achievement of the Goals set, just different. I have been in CS for a long time and seen many external recruits come into HMG departments with zero regard for the existing staff and processes, only to see them move on sometime later without acheiving the majority of what they were so brash about 'being easy to deliver'. Thanks for for your comment. I certainly have no intention of doing down the work of fellow Civil Servants, and apologise if it reads that way. 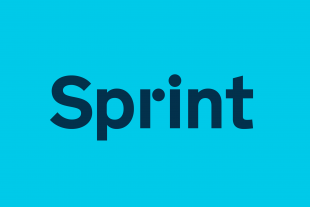 GDS looks to apply the latest agile software development tools and techniques to bear on the long standing issue of delivering high quality Government digital systems as quickly as possible and for the best possible value to the tax-payer. We want to improve the digital experience for citizens and all Civil Servants alike. I take your point re-washing-up, it was mostly said in jest, and cup-cleaning is something we continue to do by hand!. A few lessons still to learn in behaving like the Civil Servant you now are. A thoughtful re-write might demonstrate more consideration for the fellow government employees who worked hard and to the best of their ability to put together the IT contracts you so publicly mocked first time around. It might also show a little more sympathy for those working in similar (though less well remunerated) roles but with outdated technology - real people (some of them are your new colleagues) who would be delighted to be offered an iPhone as a work tool and far less pedantic about the size of MacBook Air the public was paying for them to have and use. These people, and many more like them, happily wash their own coffee cups too. Another impressive appointment by GDS. Congratulations and best of luck, Paul! Congratulations on the appointment, Paul! Looks like a match made in heaven. Looking forward to seeing great things! Congrats, Paul. You're in the right place to have an impact on all our futures. Looking forward to hearing more about developments.